Back in March i posted a few articles about scapetour. For those not aware this was an event that took place in Lisbon and Amsterdam and was organized by a group of aquascapers from the USA. Eventually it gained a lot of attention and turned out to be an international gathering of hobbyists from all over the world. 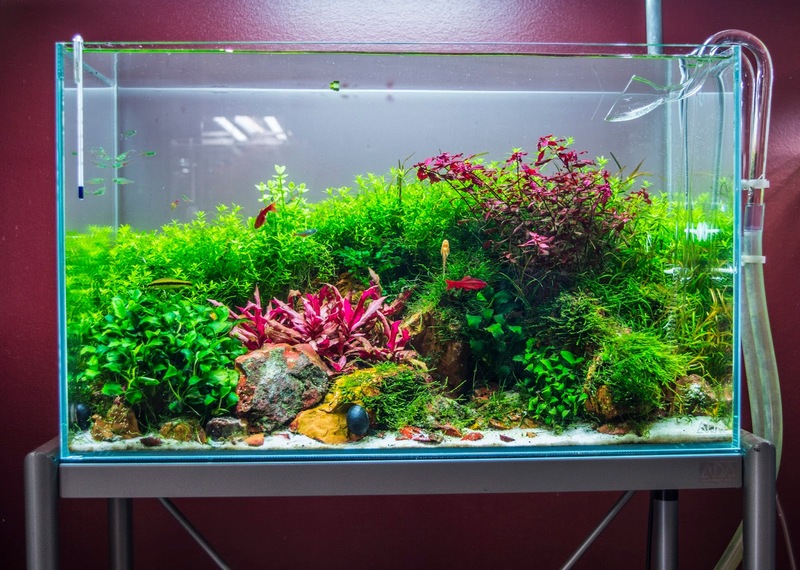 The main events were the visits to Takashi Amano's giant aquascape Forests underwater at the Lisbon oceanarium and the visit to Aquaflora in Amsterdam. But in between the group got to know Lisbon quite well and visited a few of the Portuguese main aquascaping shops in the area. Unfortunately due to work and family commitments i only attended the Forests underwater missing out on the visits to the shops and Amsterdam. I am Portuguese, however i left the country almost ten years ago and from then on i kind of lost track of how aquascaping was growing in the country. 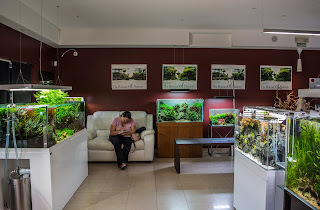 So after scapetour i decided that on my next visit to the country i would go on my own personal tour to visit a few shops and try to find out how aquascaping was doing in Portugal. The original plan was to visit three shops and a fourth visit to the Forests underwater. I contacted all three shops ahead of schedule through facebook to arrange for the visits and informed that my tour was to be part of an article. I made sure i asked permission from the shops to feature them in it. I got replies from two out of the three. In Portugal i live in Setubal a small town on the banks of the Sado river about half an hour south of Lisbon. 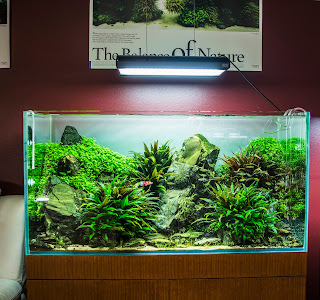 Accompanying me on the tour was my wife, she's not really into aquascaping, but finds it beautiful and loves that i do it, besides she's my loyal companion on these visits. We left around 9 A.M and our first stop was aquaeden in Malveira, the trip there was roughly 1 hour. I couldn't contain my excitement. I want to focus this article on the entire tour, however i want to do it in detail so i will divide it in parts. One for each different place i visited, this is part one. Aquaeden's reputation as a world class shop is well known amongst aquascapers all over the world. I had the pleasure of visiting the shop back in 2015 during a hardscape challenge they organized. I loved the shop, but at the time because it was a very busy event i really didn't get to know the owners personally. 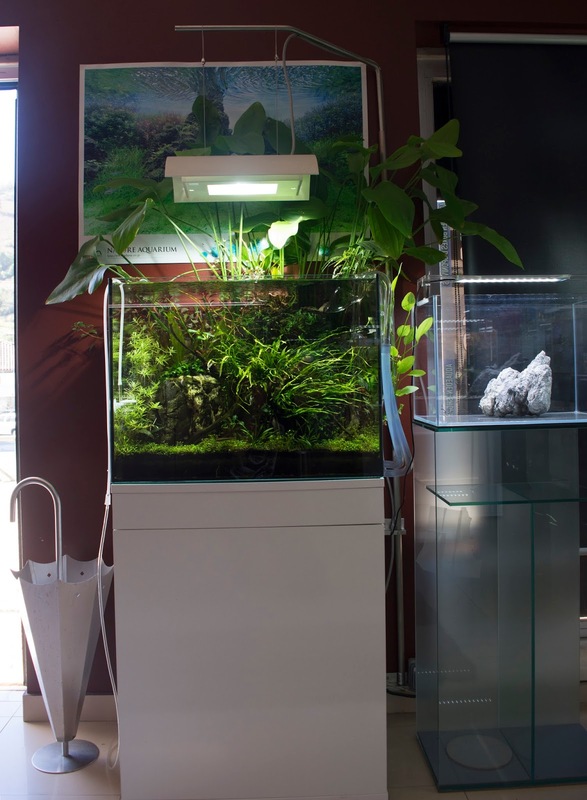 Rui and Sonia Alves are really nice down to earth persons, Rui is passionate about aquascaping, but most of all he is passionate about the Nature aquarium as Takashi Amano envisioned it. 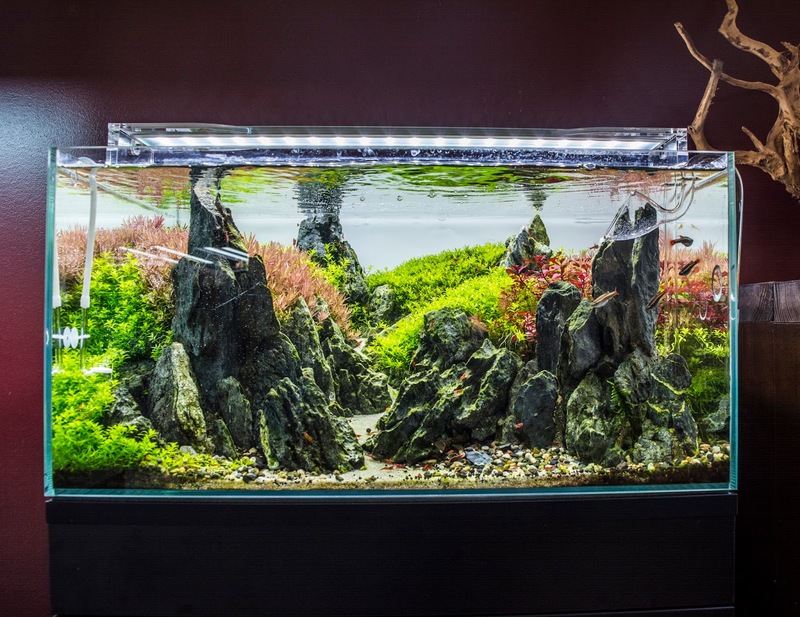 They are also known for their aquascaping marathons, these are a series of weekly back to back workshops and challenges that are organized every year around the months of September to November. And they are also gaining fame for their record streak of 91 weeks in a row assembling aquascapes for private costumers. I believe its a world wide record that has caught the attention of shops around the world. The shop opened at 10.00 A.M we arrived at 10.21, i stayed outside a while and took a picture of the shop from the outside, i noticed the posters already announcing this years scaping Marathon. 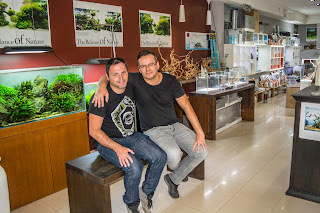 I was a bit nervous and excited, while on the way i thought about all the questions i wanted to ask Rui, he's not just one of the best aquascapers in the world, he's also one of the Portuguese aquascapers i used to follow in the forums as a begginer, way before the shop was born. When i went in i felt the first signs of the passion that drives it, as it was early and there was no costumers, yet despite that and the fact that all the tanks looked amazing Rui was with his hands on checking and making sure everything was fine. I am more used to go to shops were i have to tell the staff sitting by the counter that one of their fish is either dead or dying and if they can do something about it. From the get go Rui was friendly, and he genuinely acted like a passionate aquascaper, instead of a business man just trying to make a quick buck and shove as much gear as he could to unsuspecting costumers. That impression was further enhanced during my visit as costumers came in and he and Sonia went out of their way to answer any doubt they had or offered advice when it was needed. 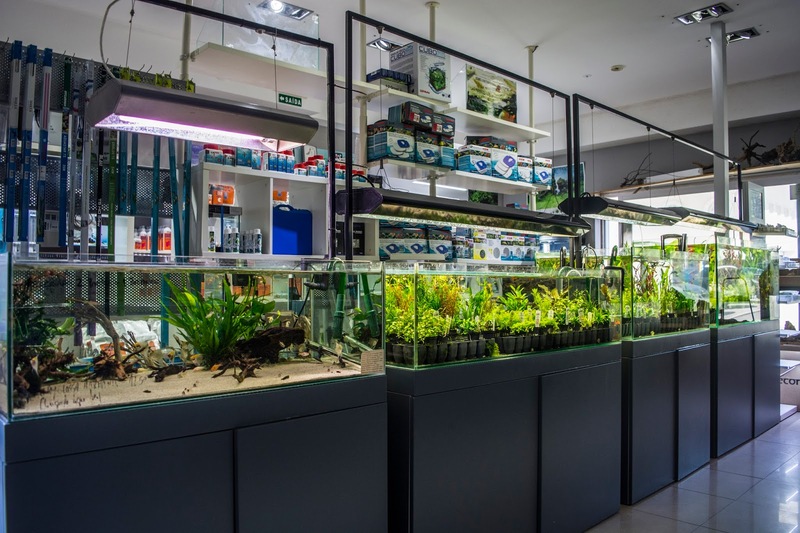 Aquaeden is not your conventional hobby brick and mortar shop, and despite being in business for around twelve years now it's also not a traditional style fishkeeping shop full of equipment to the ceiling and tanks all around the floor waiting to be sold. 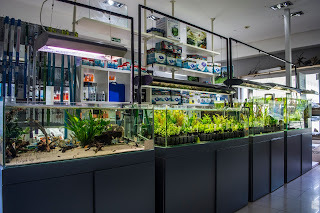 They are actually more like an aquascaping gallery that also happens to be a shop, everything in it is designed to make the costumer feel right at home and stay for as long as we wants. From the beautiful aquascapes, to the comfortable sofa without overlooking the coffee machine on the corner for those willing to have a sip. The shop feels more like an exhibit than a shop. And the tanks, equipment, hardscape, plants and fish all perfectly organized, this shop feels like a large aquascaping treasure chest just waiting to be explored. 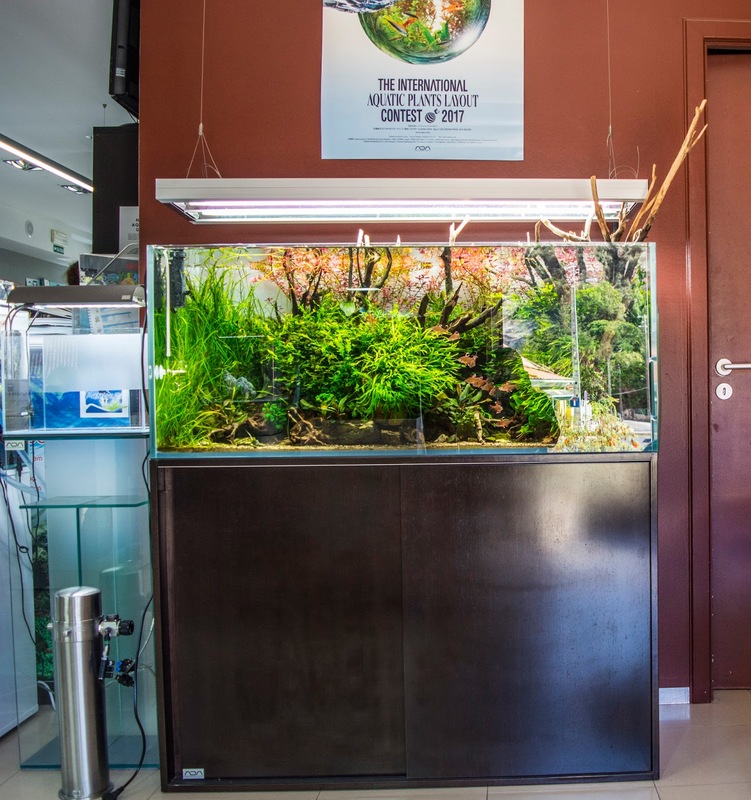 The aquascapes are top quality, crystal clear water, healthy plants with perfect greens and really bright reds, detailed hardscapes both with wood and rocks, but for all purposes in this shop the nature aquarium is King. I am used to aquascapes designed for shops being somewhat designed to be easy to keep, and thats not to say they are low quality scapes. Recently i helped George Farmer setup and amazing 1800 litre scape in maidenhead aquatics wheathley and during the event we actually discussed the need for aquascapes in shops to be as low maintenance as possible because they are in a shop where the staff is actually too busy serving costumers to be able to do heavy maintenance. Here that is not the case, every scape is more challenging than the next, and there doesn't seem to be a plan to tone down creativity to suit the needs of the shop and its staff. I spent two hours in conversation with Rui and when possible Sonia during which i made a lot of questions that they were more than happy to answer. I did not take notes or recorded them as i was there for a friendly visit, not for an interview, but i will try to replicate in this article from here on some of the topics we discussed. Please bear in mind the questions and answers are not transcribed word for word, but to the best of my memory of a pleasant conversation i had with Rui. 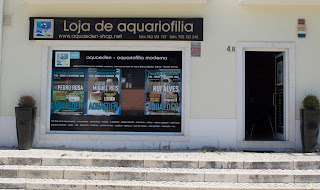 Was Aquaeden the first true aquascaping shop in Portugal? Rui smiled before answering this one. He explained that it wasn't despite my belief that it was. According to him the honor of the first truly dedicated aquascaping shop in Portugal belonged to a shop called Naturline that closed down in 2011. 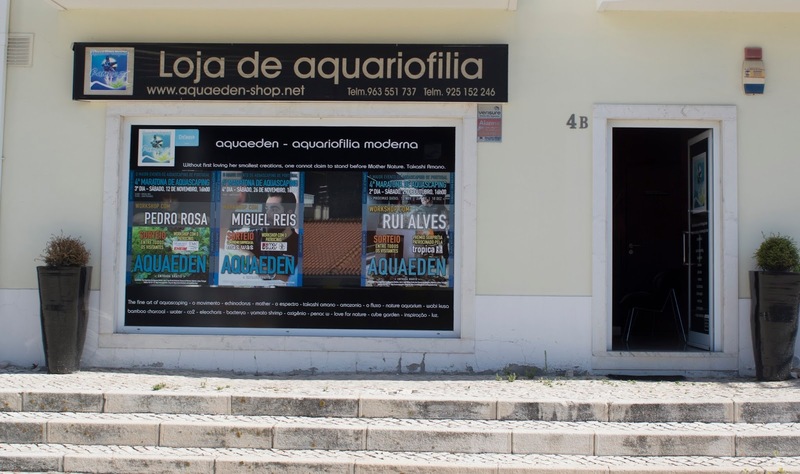 He added that he was a regular costumer in the early years and believes he was the first person to actually buy a bag of aquasoil in the country, as Naturline was the first company to be able to bring in ADA substrates into Portugal. How did Aquaeden came to be? He explained business itself started in 2005. It was originally an online retailer selling handmade T5 light units. I can confirm this as the quality of the lights "By Ramirezi" (Rui's nickname) was already legendary in the forum aquariofilia.net when i first joined. Light units were really expensive back in the day and hard to find, so everyone was going DIY, i myself made my own unit. However he was building professional quality units, and this soon got the attention of other hobbyists to the point soon everyone wanted one. And so Aquaeden was born as an online light units retailer. To add that the shop still sells the light units "By Ramirezi", and some of the tanks in the shop are still using these units. But he conceded that with the advent of LED's they are not as sought after as before. Though performance wise they are still very good. How did it go from an online shop to a physical shop? According to him this was something that came from his passion for the hobby, but it was a gamble that came out of necessity. The company that they were working for had a strict policy about personal relationships between employees. So when they got together Sonia left her job and with the online business doing well they decided to have a go at becoming a physical retailer. For a few months Sonia ran the new shop alone because he had to give two months to his former employer after handing in his notice. They originally started in another location, it had a very small size in order to make it affordable and the range of products was limited. As an example he say's he was passionate about Takashi Amano and the ADA philosophy. So he wanted to sell their products, but he couldn't afford the investment so initially he only sold their fertilizers, and as the shop grew he went into substrates and only later tanks and equipment. So it did not become what it is today from day one? He say's he always wanted the shop to live by the Nature aquarium philosophy and that quality had to be the main goal. He adds that the day he cannot deliver top quality, then its time to close it down as there would be no point for him to keep doing it. But he also adds that growth was slow, to reduce risks. This is something that he advises to anyone willing to set up their own business. He explains that he only used his own money and never used credit to setup and run the business. This obviously made the growth slower, but it also meant that everything put into the shop belonged to him, which reduced the risks of failure. He believes that many of the shops that fail these days, do so because they want to start big from day one, so they fall into debt and that eats away into their profits and forces them to close down. He explains that the desire to deliver top quality and the passion for the hobby were in the shop from day one, that has not changed, however the original shop was nowhere near the current one in size and amount of aquariums displayed. 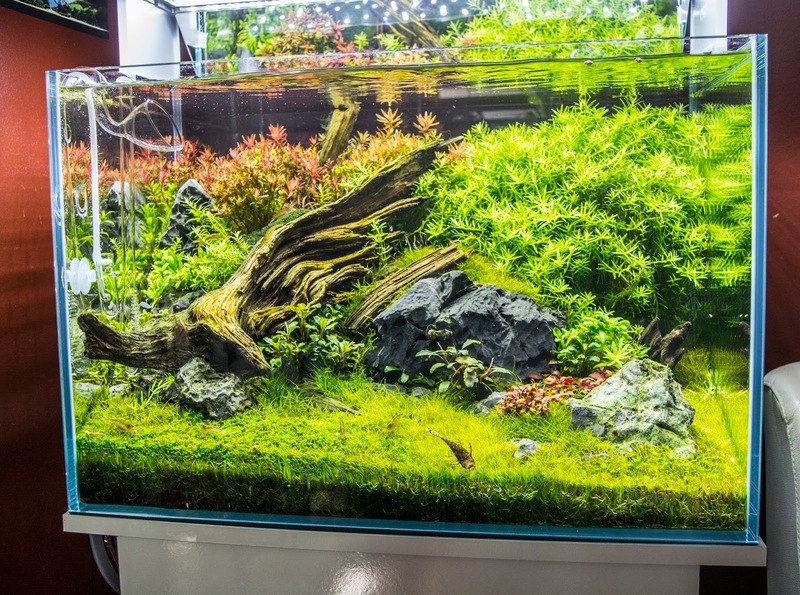 When you mention quality are you referring to the aquascapes? When talking about quality he actually explained that its much more than the aquascapes. They do have to look pristine, and he is a bit of obsessed with it. But its more than that, he explained that unlike old style fishkeeping shops he only stocks product from a small group of companies. In essence he wants the shop to stock the top quality, however that's not the main reason for a smaller range of brands in the shop and he actually went on to highlight the different brands the shop sells and you'll find a good amount of choice. The main reason is he believes as a shop they need to provide expert service to their costumers, so the products have to be tried and tested. Everything they sell, they use in the shop themselves and by keeping a smaller range they are able to get to know the products in detail and that allows them to better advise their costumers. 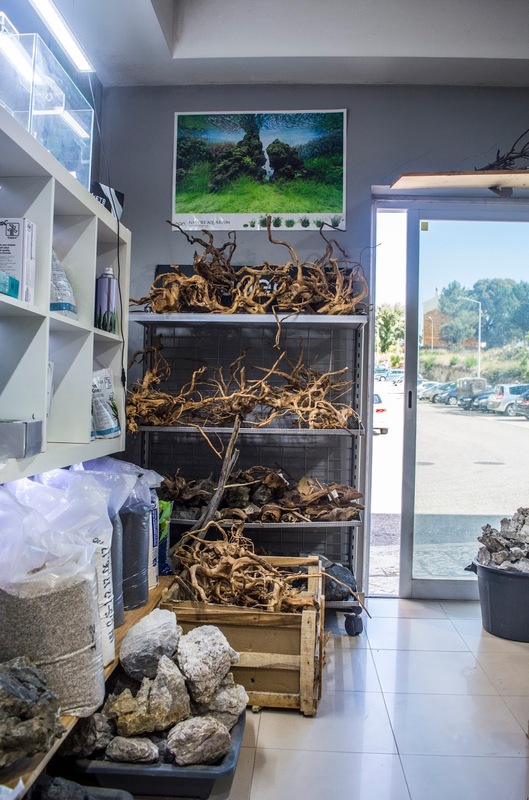 How do you see Aquaeden's role in the aquascaping hobby in Portugal? He starts by saying that as the shop owner it is always suspicious for him to answer this question. And i could see he was reluctant to answer it. However upon my insistence he told me one of the greatest achievements was in bring a larger selection of products to Portugal. I asked him if he was referring to the close connection between the shop and ADA and he said that to some extent yes however in this case he was really referring to hardscape materials, plants and equipment. There was a lack of materials back in 2005 when the shop opened and he likes to believe that it played a role in helping to make materials available more widespread. Some of the hardscape selection and the practice box. During this part of the conversation we actually went through a large variety of scaping materials available, they also have a practice box where costumers are allowed to try out the materials to make sure they get the right ones for their projects. The other impact he believes he had is in the amount of costumers that over the years became regular contestants in the IAPLC. And to this all i can say is that, i remember quite well that when attending the hardscape challenge in 2015, i noticed that there is a great push from the shop into encouraging their costumers to compete. Tell me about the 91 weeks record? He laughs it off saying that he remembers back when the physical shop opened that he and Sonia thought that if they managed to get two private costumer assemblies a year, that it would be a good year. It was a slow start but over the years the amount grew and today they are on a record 91 weeks always having at least one assembly for private costumers. I asked him how many assemblies have been made in these 91 weeks and he replies that to be honest he really does not know. They count assemblies made from Monday to Friday for the record, and he can say that they do at least one a week, many times more and that their schedule is already full up to the end of October beginning of November. He also explains that he can't say the exact number because on top of the scheduled assemblies, during weekends he hosts costumers that can just bring in their aquariums (only up to 80 cm) into the shop and the team will scape it there and then for the costumer so he can take it home. These assemblies are not taken into account for the record. Do you also do maintenance on the aquariums you assemble? He explains that at the moment the shop is doing between 22 to 25 maintenance visits per week. They have a member of staff, aquascaper Miguel Reis that is in charge of travelling around the country doing these. He say's that they have requests from costumers to do more, but with the current staff, that's all that they can take. Can't you get more staff to do it? He tells me that it's hard to get staff. Miguel is been with them for two years and he's doing a great job. He's had other promising aquascapers working in the shop but eventually they left as they found the job was quite hard. 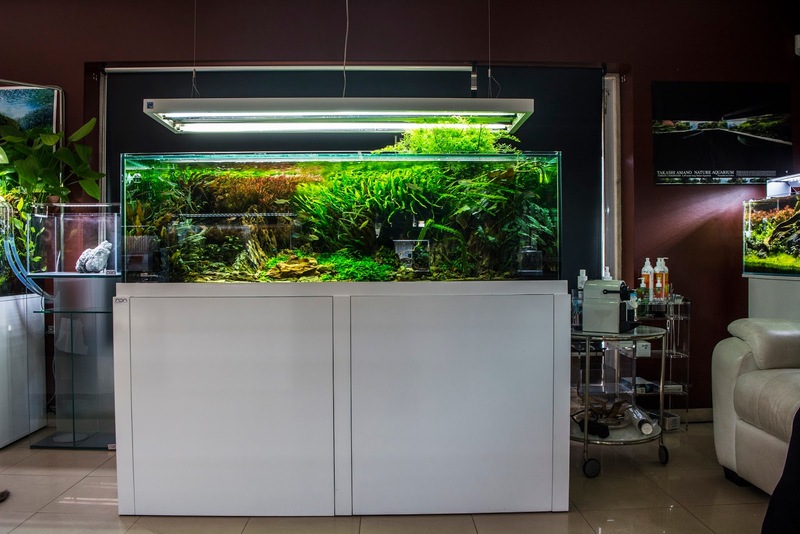 He tells me that in part that may be because he is extremely demanding when it comes to quality, the aquascapes, either being in the shop or at a costumer always need to look pristine. The service always needs to be top notch and that requires many excruciating hours doing maintenance. Many of the staff he had where talented aquascapers looking for the dream of working in the hobby they love, but it stops being a hobby once you make it your job, Miguel adapted well into that and understands that its a hard job. Others did not and he had to let them go, he can't put the quality and reputation of the shop at risk, because the day he's prepared to do that, is the day he has to think about closing it up and retire. Unfortunately that pursuit for quality comes at a cost, its hard to get staff and him a Sonia have to do all the work, meaning for example staying up until 4 A.M on Fridays to do the weekly maintenance in all the tanks. 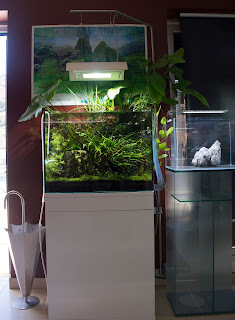 When i asked him how can they manage it, he replied "Their passion for aquascaping and Nature aquarium". Tell me about the Marathons? He explained that the Marathons was another way the shop had a big impact in the hobby in Portugal. Actually he would dare say that it was when they started holding them that they noticed an increase in the amount of new hobbyists coming into the store. In the beginning they had a small shop, so there was no space to hold events for their costumers. However when they moved into this bigger one, they were finally able to start doing workshops. The goal was to try and teach not only existing costumers but to get new people in. Originally the idea was to have a workshop every now and then. However while discussing it, someone pointed out that they now had a rather large amount of display aquariums that needed to be scaped every one or two years. So the idea was put forward to do them on a yearly basis in a back to back series of events being hold every week around September and October. And they have being doing it every year since. This year however they are planning to update the format, it became obvious some costumers wanted to attend all the events, this was rather hard when they were done on weekly basis. So Rui told me they are planning to hold the marathon on one event per month basis. The dates will posted soon, i hope to be able to travel to Portugal to attend at least one, so if you're interested keep on the look out for posts from Aquaeden on Facebook regarding the dates. He also told me they always have a full house on these events sometimes having 80 plus people in the shop. How do you see the future for Aqueden? He say's that its an interesting question, one that has been on his mind for some time up to last year. They thought about opening a second shop, financially this shop's success makes it viable. 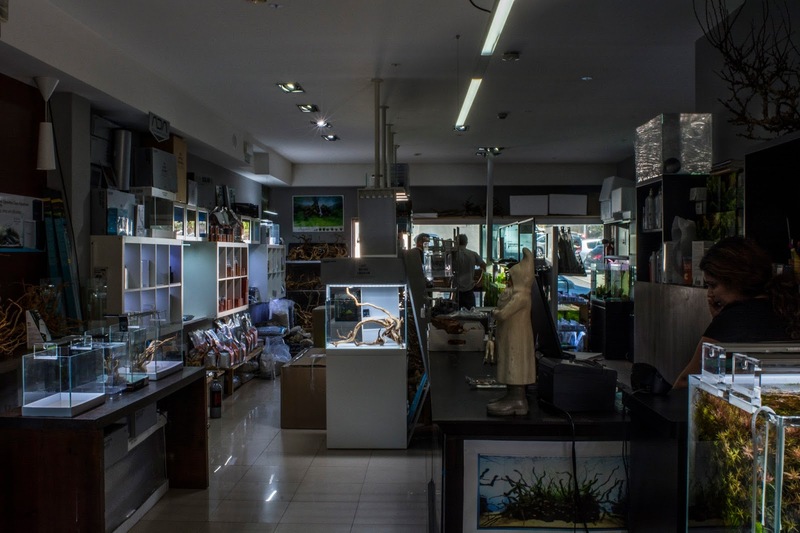 The problem is logistics, he can't be in two shops at the same time, Aquaeden's success comes from his almost obsessive commitment to quality, and he doesn't want to sacrifice that just to open a second shop. He's not expecting to get rich from aquascaping. He believes that a second shop would have ok quality, as he would not be able to physically guarantee his high standards were kept, and a third shop would be plain rubish. That would not only damage the brand and reputation that took so long and hard work to create but would also lead to the original shop losing its costumer base. So to him the future of Aquaeden is here in this shop and he believes they keep making it everyday. To this he gives the examples of lessons learned over the years and how the approach into keeping their aquariums has evolved. He says has a hobbyist he wanted to keep as much tanks as possible, he actually had six in his small room before having the shop, and originally this side of his personality was seen in the shop. They would rescape more often. 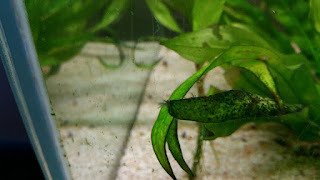 Now they feel they have matured and are pushing the boundaries of what can be done in aquascaping, they are keeping their scapes for longer and longer trying to see for how they can keep the quality in the long run. He points the largest display in the shop that despite being around 2 years is still looking top notch. 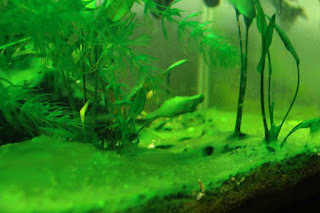 It has a lot to do with how he himself matured as an aquascaper, but also has a way of challenging himself. 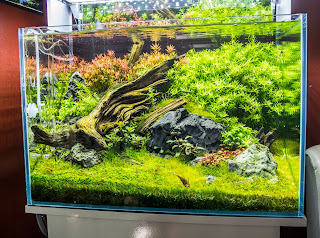 They hope to not only extend these boundaries but also pass it on to their costumers, in a way he relates it back to Takashi Amano, in that nature aquariums can and should be kept for the long run so that they can also be seen in a more matured state. 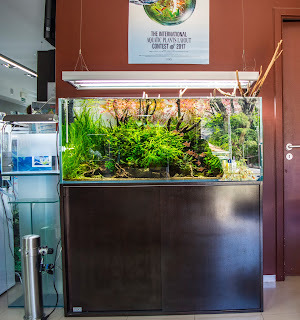 Because it was born out of passion, it's more than a shop, this way all hardships can be overcome, and when you enter the shop you can see it, in every single aquascape. I have not visited many shops like this one. 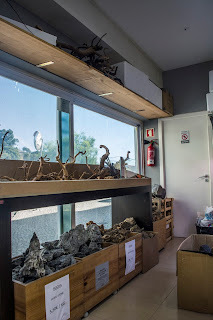 The second part of this article will be published soon, as after leaving Aquaden we headed back to Lisbon to my fourth visit to the Forests underwater exhibit . But before we left, Rui and Sonia were kind enough to invite us back, and next time to come with more time as we were invited for dinner. I went to visit an aquascaping shop and came out having made two new friends, thats not something i am used to when i visit aquatic retailers. 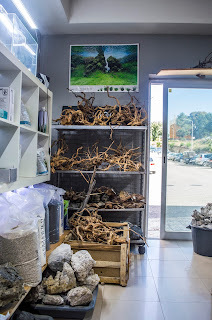 This shop is special and a must visit for any hobbyist visiting Portugal.